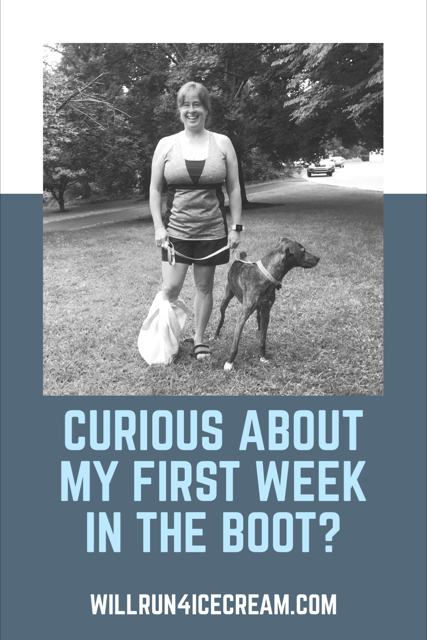 Curious About My First Week In The Boot? Well, I could tell you that it's been sunshine and rainbows, but the reality is ... it hasn't. I've been in the boot for 5 days, and I know that I have shed tears at least 3 of those days. I'm still in pain, but thankfully it's less than the beginning of the week. But mainly I've felt overwhelmed! I am dealing with a lot of stress right now (but honestly aren't most of us in some way or another????) But as you know exercise, running, and sweating it out was my stress reliever. So, yep, it's been a tough few days to try to get a handle on things. And unfortunately I've turned to food more than once for comfort which only left me feeling emotionally and physically worse. So as I'm coming to the end to the 1st week in the boot, I'm still looking for a better outlet to help with stress. Also, I realized that without exercising I'm not getting those few minutes in the morning for me. Usually I'm getting up earlier than everyone else and getting in some type of workout before Hubby goes to work. And I've really missed that time to take a moment to breathe. Soooooooo I realized that I'm going to have to continue to get up early and maybe take some time for myself to clear my head and get situated for the day. Does that make sense? I have been able to do some upper body work. And a friend from View From The Back Of The Pack sent me a link (Click on her site) with an awesome list of workouts and guides that she did when she was injured. Today was my first chair workout. I can't say that I worked up a major sweat, but I did at least feel like I did something. And I plan to do more chair workouts as the weeks roll along if I can keep myself motivated. It's not the easiest to stay motivated, but I plan to do the best that I can. This setback (although it's on the coattails of the hip injury so it feels like ONE LONG YEAR OF SETBACKS) is only temporary. I will get out of the boot. Things will heal, and then I will have to start the slow process of building back. But for now, I'm 5 days into this process, and I'm working working on trying to find other healthy areas to relieve my stress.